soon on the "most wanted list"? Of course there is nothing new here for those who have been following closely Venezuela here. Already ABC in Spain has run into trouble for accusing Diosdado Cabello to be the head of the main drug cartel of Venezuela. What is noteworthy in the WSJ work of Cordoba and Forero is the compilation nature of the thing, of not unnecessarily stressing the role of Cabello. The implications are frightening: the tentacles of drug trafficking that Chavez allowed go much, much deeper than what anyone may suspect, even today. But what is the most worrisome line in the whole piece is the quotation from someone who knows Cabello from afar. Julio Rodriguez, a retired Colonel who was Cabello classmate or something, qualifies him as a "kamikaze", "someone who will never surrender". 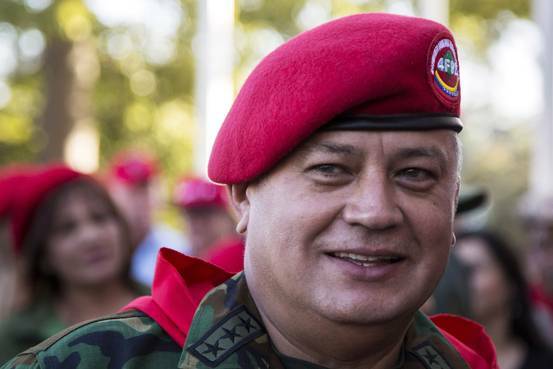 In other words, Diosdado Cabello will take down with him as many as he needs to take down. He will take the country down with him if he needs to. Thus, even if the primary elections results of yesterday were a very positive sign for the opposition, even if chavismo sent out its loud mouth pieces to vilely trash them the best they could, that is not the issue. 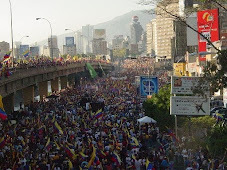 The issue is the nature of the beast true civilians in Venezuela are facing. At least we can take some solace in the comfort that after ABC in Spain, the WSJ piece of yesterday (front page today) will not allow for international public opinion to look the other way anymore. Diosdado Cabello may be able to close the last information outlets in Venezuela but that will only confirm what these newspapers have been writing and making public. Venezuela IS the NEWEST NARCO STATE and as such Venezuela is now a major problem for the west, just as northern Mexico is, just as Colombia was. Just keep in mind what the drug war of Northern Mexico is costing, what Uribe and the US had to spend to control Colombia and you will know what will have to be done about Venezuela if international pressure does not grow faster. In particular from the rest of Latin America which are going to be the first victims, by the way. But possibly drug traffic money is also reaching there deeper than what we may already suspect. PS: the strangle hold on remaining "free" Venezuelan media can be seen on Google news which has become nearly useless. With all the state media supplemented with allied stuff like Cuba's Prensa Latina, the Google page on Venezuela is crowded with favorable news for the regime and one needs to scratch hard to find more critical coverage unless foreign newspapers make headlines out of Venezuelan news. Well, today it is such a day where regime sponsored media cannot overcome bad press as seen out of this screen shot at 1 PM Europe time. In spite of all regime set ups, the investigations on Diosdado is number one main news leaving in second propaganda "news" on food distribution (100,000 tons, yeah , right) and how young couples benefit from new housing (yeah, right, as long as they have the right red connections). 1) Is it necessary to remind readers that investigations on crime in the US are independent from the executive branch as there is separation of powers and that the intervention of this last one is reserved strictly on actions that may be taken according to national interests? Once any country becomes one of the "standard, go-to" for "baddies, drug lords, crooked pols and other assorted rifraff" in the artistic media (TV, Film, Video Games) then it's done for. Not that fiction should be the arbiter, per se, but because it becomes an identity for that country in the wider global audience, well that's hard to overcome, isn't it? Actual reporting that confirms, in real life, that the fiction does have a rather firm backdrop is just one more nail in a coffin that is slowly becoming more metal than wood. Correct me if I am wrong but Castro was a drug kingpin as well. So the world will know Canello is a drug kingpin of Venezuela. Will it change anything? Your point that removing him and how he will take down the country first is well noted but they are already doing that. The country is present and future has been destroyed. The populous is very poor and has nothing and does not care enough to do anything. It would take someone like Chavez but from the right to rally the people like the sheep they are but the govt will never allow a person to run free and connect to the populous. The people with pride and fight in them are few as most left the country and the leaders are in jail. I try and find hope in my thoughts for Venezuela but simply cannot see how this mess gets cleaned up. Seems to me you can't compare Cuba's Geo-political position to Vzla's strategic location as a gateway right next to Colombia, Bolivia, etc. The logistics are much easier and more dangerous. Colombia and Bolivia could not move HALF of their Coke through la Havana..
All the more reason to end the US war on drugs. Latin America can't be free while it rages & the US meddles there. Please, explain to us in which way it helps Latin America that the US opens its border to cocaine consumption from LatAm, like a NAFTA like for drugs. Don't forget the legalize part. The drug trade only fuels so much killing & corruption because it is illegal. For some odd reason too many think that legalizing drugs means legalizing the other criminal things drug dealers do, it doesn't. What I'm saying is that in the hands of regular businessmen the drug trade would be way less harmful. Not to mention it would end US efforts at drug interdiction in LatAm. It would also end the boatloads of money going to unsavory characters like FARC. It seems obvious. No, it is not obvious. One thing is to legalize pot. Another is to legalize crack. Being that the cocaine trade is more dangerous & kills more people it's more important to legalize it. I don't want to see people destroy themselves with drugs. I'm in recovery myself. We have to face the reality of what the war on drugs does & doesn't do. It doesn't stop people from getting drugs & it does do much harm around the world. Legalization is the only way out. If drugs were legalized Darren then where would the CIA get all its illicit operating money from? You try from a point of logic but the world is not that simple, the CIA has founded arms trades, drug business and wars forever. Is the arm of the elite. The oil trade's completely legal. The income doesn't seem to benefit Venezuelans much. True & it's also completely socialist. More proof that socialism doesn't work. Daniel, one thing to mention from my perspective... This US Report on Cabello etc- will only give Mad-uro something else to use that the Evil empire is trying to throw a wrench into Venezuela politics, etc.. I don't expect to predict the future, but so far Mad-uro seems to cling on... I am always amazed how long he has lasted... It will be very difficult to get solid evidence because EVERY Branch of Venezuela Gov't is controlled by the reds... Police, Forensics, Judicial.. unfortunately, tough road ahead .. The US does not need Venezuelan evidence, they are collecting the evidence on their own. ..the executive branch as there is separation of powers and that the intervention of this last one is reserved strictly on actions that may be taken according to national interests?" - Sudden incrimination of Vzla as an "urgent threat" to US interests. The US might be preparing to use Obama's last months in power to shake the Latin-American tree a bit more. Hey, blame it on the outgoing Democrats..
Daniel, let me praise you for publishing. You are the best blogger in English my friend. I appreciate the feeling but I would not pretend to such an honor. However I think I may be one of the most purposeful and that gives a form of clarity that is appreciated by some.